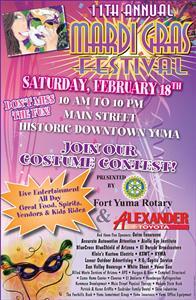 Fort Yuma Rotary's Mardi Gras Festival Coming Soon! Fort Yuma Rotary's 11th annual Mardi Gras Festival is happening February 18, 2012. Alexander Toyota, Geico Insurance, Accurate Automotive Attention, Aiello Eye Institute, Blue Cross Blue Shield, El Dorado Broadcasting, Klein’s Kustom Electric, Inc., KSWT, KYMA, Lamar Outdoor Advertising, P.U. Septic Service, Sun Valley Beverage, The Sun, The White Sheet, Allied Waste Services of Yuma, APS, Burgers & Beer, Campbell Structural Engineers, Cavco Home Center, Chevron, El Desierto, Hansberger Refrigeration, Kammann Development, Main Street Physical Therapy, Mohave State Bank, Pat & Karen Griffin, Sackrider Family Dentistry, Shaw Industries, The Foothills Bank, Yuma Insurance, Yuma Investment Group Wealth Management, Del Outdoor, Lutes Casino, Nexgen.